Russia is trying to hide its involvement in the terrorist act prepared by Verkhovna Rada deputy Nadiia Savchenko and head of the Officer Corps Center for the Release of Prisoners Volodymyr Ruban, Chief of Ukraine's Prosecutor General's Office (PGO) Yuriy Lutsenko has said. 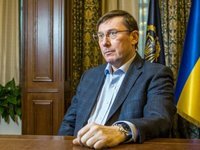 "This is not a ridiculous thing, it's not a political matter - it's a matter of a terrorist act against the Ukrainian state ... a thread that leads to Russia's top leaders," Lutsenko said. He said to approve such an operation gives him grounds to believe "leaders of military units, senior officers of Russia's armed forces" were involved. "Moscow always tries to cover its tracks, but the military prosecutor's office keeps everything fixed," Lutsenko said.